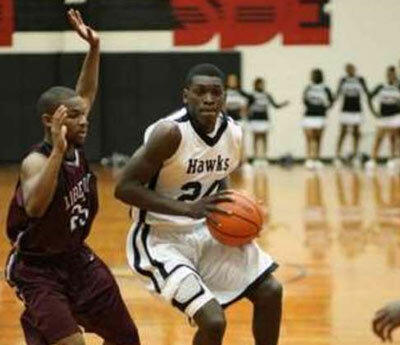 Welcome Devin Harris, the newest member of the 2013 signing class. Harris burst onto the recruiting scene in recent months with his leadership in his team’s state championship run. Although Harris’ versatility and size (6’4″) are his calling cards, he’s also reported to be a crafty point guard who can lead a team. With sophomore Petey McClain as the Bucs’ lone point guard, Harris is a sorely needed commodity for next year’s squad. The highlights below showcase Harris’ size, skill, and smarts. Welcome Devin! Preseason games against inferior competition don’t have a lot of predictive value, but after games against Carson Newman and Young Harris there is good reason to be more upbeat about the Lady Bucs than in the last couple of years. Last season was such a disappointment: there was enough talent on the floor to take LSU into overtime – and the Tigers needed a last second shot to avoid losing in regulation. Too often in other games there was ugly, disorganized, listless play. But boosted by transfer and freshman talent, the young Lady Bucs have come out strong, averaging 80.5 points and 57 rebounds in two wins. It has been fun to go the women’s games again. GUARDS: Freshman Brianna McQueen has been handed the keys to the car at point, and drives it like an experienced hand. A little undersized at 5’3”, she’s got speed, a great handle, good vision, the ability to hit from three, penetrate and pull up for the midrange jumper, or take it to the rim, shifting hands for a layup. She’s averaging 30 minutes a game, 11.5 points (shooting percentages need to be a bit better (8-22 and 2-7 from 3) 4 assists, but too many turnovers at 6. She also plays tough defense, grabbing 2.5 steals and 4 rebounds a game despite her size. She needs to be more efficient and better controlled, but the talent here is remarkable. This gal is almost as much fun to watch as Petey McClain for the men. Brianna Bogard, now a sophomore, is McQueen’s more efficient counterpart, averaging 16 minutes, with 6.5 points on 5-12 shooting, 3-9 from 3, averaging 3 rebounds, 1.5 assists and 0 turnovers. When Brianna entered the game against Young Harris, we were down 9-2. Five minutes later it was 15-14. Even though she wasn’t posting big numbers, things just ran well with her on the floor. 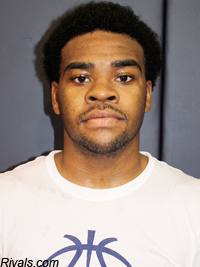 Junior Shawn Randall is the biggest and perhaps the most physically gifted guard at 5’7”. She still struggles with the tendency to follow a remarkable play with a turnover. She may be improving though – against Young Harris last night, she got 4 assists and only 1 turnover, compared to 1 assist and 5 turnovers against Carson Newman. She has averaged 18 minutes, 7.5 points and 4 rebounds and 1 steal. But the up and down nature of her play may be seen in the fact that one game was 14 points, and the other was only 1. POST: 6’2” Tosha Austin, now a senior, has gotten limited playing time this year, averaging 9 minutes with limited production. Last season she was the only Lady Buc over 6’0”. This season, the Lady Bucs have four (4) others: 6’2” freshmen Jasmine Kemp and Imani Martinez, 6’2” transfer Serena Clark, and 6’3” transfer Tiana Burley, who will be eligible next semester. Tosha may still be valuable, especially as a rebounder and defender, but will have to battle to get on the floor. The big news inside is 6’2” Clemson transfer Serena Clark, a redshirt sophomore. She is slim, but strong, and has great length with a tremendous wingspan. She seems an inch taller than the other gals listed at 6’2”. She’s averaging 28 minutes, and fourteen (14!!) rebounds, and 9 points on 10-19 shooting. 6’2” freshman Jasmine Kemp is rangy and physical – averaging 16 minutes a game, with 2.5 steals, 1.5 blocks, 3 rebounds and 3.5 points on 3-6 shooting. She is a defense force with a knack for anticipation and stepping into passing lanes. Just wait till big 6’3” transfer redshirt sophomore Tianna Burley becomes eligible next semester. FORWARD: Team leader Destiny Michell, now a junior, seems to be rejuvenated. Last year, coming off a painful knee injury, she seemed tentative, particularly early in the year. This year she seems back to her ferocious freshman year play. She averages 30 minutes, 12 rebounds and 23 points on 20 of 34 shooting and 3 steals with 3.5 assists and 2 turnovers. I love her play but wish that someone would get her to scrap her willful, pointless, slow motion free throw shooting display. She could only get better (6-9) if she would get a crisp, focused, repeatable routine. Much depends on her keeping her intense, productive play… and on avoiding the temptation to get selfish and self important… a temptation that always comes to the best player on the team. Part of last year’s collapse was a collapse in morale, and that is something that our best player must help us avoid. Destiny has also expanded her shooting range so that she can face up and reliably knock down the 15 foot jumper. Sophomore Maria Bond at 5’10” has been starting and averaging 16.5 minutes, with 5 points and 2.5 rebounds. Sophomore Amy Duke has averaged 22.5 minutes and shown remarkable improvement with 8.5 points, 4 rebounds, 3.5 assists and a nasty 3.5 steals. She has added a 12 foot face up jump shot that is money. At a rangy, powerful, athletic 6’0” she plays with an energy, abandon and grace that is reminiscent of John Walton on the men’s side, and is the lady most likely to be diving for loose balls. The least heralded of last year’s recruits, she may have the best upside. She was stunningly effective against LSU’s big strong women last year. If she can turn that into consistent play this year, it will be a remarkable addition for the Lady Bucs. Biggest downside for Amy is an average of 3.5 turnovers. With all the strong front court players this year, a very promising athletic 6’2” freshman, Imani Martinez, has had a hard time getting onto the floor, averaging only 6 minutes, but still pulling down 2 rebounds per game, a better rate per minute than either Amy Duke or Mariah Bond. She also showed a very nice midrange shooting touch in the Bluenanza. This gal can play, but may have to wait for her opportunities. Thinking of redshirt might be worthwhile, if she has the kind of patience that Lester Wilson did. Redshirt sophomore Ashley Miles 6’1”, recovering from an ACL tear, has had even more limited floor time. The ASun: Stetson, led by pint sized warrior and ASun POY Victoria McGowan, returns everyone, including All ASun 6’0” Sasha Sims, and is the team to beat. FGCU loses 4 of their best 5 players, and still has one of the best returning nuclei with POY candidate Sarah Hansen, Oregon State transfer Britney Kennedy, stud Valpo transfer, 5th year Senior Betsy Adams and sharp shooter Lerrin Cook. Adams led Valpo in scoring with about 13 points per game and 2.2 from 3 before a knee injury. She will be eligible to start immediately. FGCU would have been even tougher but have recently lost 6’3” sophomore Whitney Knight, who was ASun All-Tournament team as a freshman, to a torn ACL. These two teams are chalk – but not unbeatable. Everybody else in the ASun are less than strong – we should beat those teams. FGCU will have a distinct size disadvantage against ETSU, with only 1 player 6’1” (skinny Greek role player Anthi Chatzagiakoumi – NOT an inside threat) and 1 player 5’11”. Everybody else on the squad is between 5’7” and 5’10”. Coach Smesko recruits only one specific type of interchangeable do-everything player, who can shift from post to perimeter to create mismatches and shoot the lights out. 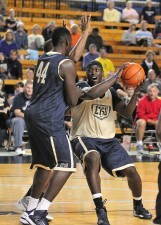 But that may leave them vulnerable to an ETSU squad that is both very tall AND athletic. 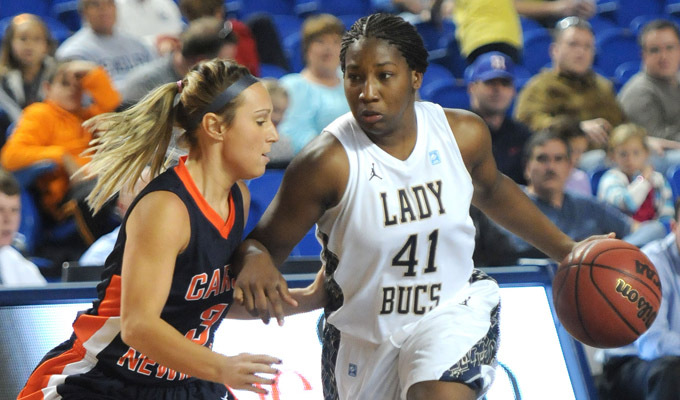 SUMMARY: The Lady Bucs are much bigger this year, and will be the longest team in the ASun. The addition of 4 athletic 6’2” or 6’3” players, transfers Serena Clark and Tianna Burley, along with freshman Jasmine Kemp and Imani Martinez, the improvement of Amy Duke and Mariah Bond, and the rejuvenation of Destiny Mitchell leaves the Lady Bucs strong inside. Rebounding and interior defense should be a given. Guard play has the potential to be much improved. But that needs to be proved on the Court against real competition. The Lady Bucs are also very young: only Tosha Austin is a senior. Outside shooting, and offensive execution remain the question marks at this point. But there is more reason to be optimistic than there has been for the last two years, since Sierra Evans and Taronda Wiles graduated. 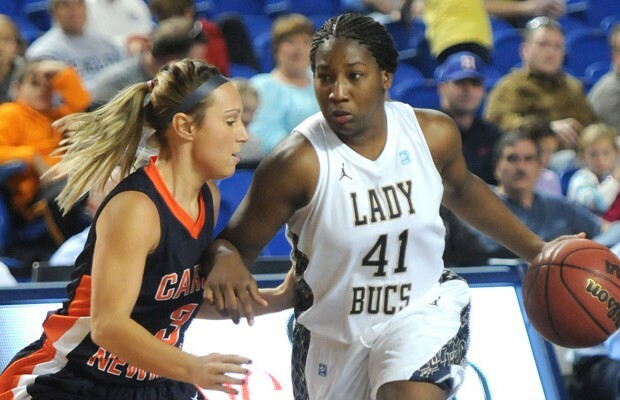 Young Bucs Brianna McQueen and Jamine Kemp should be ASun All-Freshman. Imani Martinez has the potential to be, if she can get the time on the floor. This young team has lots of room to grow. And right now it is fun to watch them grow. Evaluation: Supernatural leaper with power and speed “Mo” plays with a real swagger on the court. Strong driver, who is becoming a solid ballhandler, he is simply too physical and fast for players to check him going to the rim and he can explode right over the help at the rim to finish. Developing shooter who is also improving his basketball IQ. Good rebounder and defender who should dominate these areas every game with his physical gifts. ETSUhoops.com will track and report on O’Field’s commitment. Update 8/13/13: Unfortunately O’Field wasn’t able to qualify academically at ETSU and is headed to Midland Junior College in Texas. Hopefully in two years we’ll be hearing Maurice O’Field’s name again. 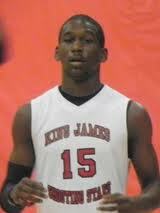 Cleveland native Maurice O'Field (John Hay HS) is headed to Midland College (TX). Remember that name in 2 years. The Bucs have four scholarships to give for the 2012-13 recruiting class. The early signing period runs from Nov.14th to Nov. 21st. Newcomer Kinard Gadsden-Gilliard, aka KGG, going hard to the rim against fellow newcomer and Providence transfer, Ron Giplaye. Finally, a Bluenanza that really hit the mark. After a rocky ending to last season and the loss of 3 core players, there was a real air of suspense to see the new guys and what was coming back. In recent years we’ve had some new guys that didn’t live up to the advance billing (Curtis Wilkinson and Anthony Johnson) or that weren’t quite ready for the D1 stage. And the conference competition, despite the loss of Belmont, is stronger and deeper than ever, with experienced, quality, well coached teams at Mercer, USCU, FGCU and UNF. But this year, the Bluenanza left no doubt that the Bucs have talent on the floor. At guard, the returning guys are ready to go. Sheldon Cooley looked like he’s ready to pick up where he left off the last 15 games of last season, where he hit 15 of 33 for 45% from 3. Marcus Dubose meanwhile was masterful, slashing and shooting with confidence. I think that this year’s talent will remove a little of the pressure on him to be perfect from the field, and will allow him to let the game come to him and be a little more relaxed about his play. When he’s playing with this kind of confidence, he’s remarkable. The real head turner of the returning guards was Jarvis Jones. On a very athletic squad he may have the best vertical leap of all, and flashed it to good effect in the slam dunk contest, especially in a whirling 360 reminiscent of Justin Tubbs. More importantly he flashed it on the floor where he was not content to hit catch and shoot 3’s but slashed to the basket. He seemed really fired up by the challenge of young shooting guard Mario Stramaglia. In a scrimmage where defense was not exactly a priority, Jones climbed all over Mario. And when Mario hit a 3, Jones would come right back and go for one himself. If Jarvis can play with this kind of athletic fire, he could be a revelation this year. Hopefully he can bring it every night, since consistency was a problem last year. The ASun is loaded with quality guards this year, from Langston Hall at Mercer, to Torrey Craig at USCU, Parker Smith and Jerron Granberry at UNF, and a fleet of them at FGCU (Sherwood Brown, Bernard Thompson, Brett Comer). But the Bucs could be fielding one of the best front court rotations of all in Cooley, Jones and Dubose. Pity that we won’t be seeing Jarvis in action till December. And we haven’t even mentioned the new guys at guard. Petey McClain certainly showed the speed to blow by people and get to the rim. He can penetrate and finish, or pass off. We’ll need to see more about his shooting and defense. We’ll need to see what he can do against heavy defensive pressure. Mario Stramaglia had to battle Jarvis for everything, but that rivalry can only help. He’s got surprising leaping ability, muscle and a work ethic that guarantees that he will only improve with experience. In the frontcourt, Kinard Gadsden-Gilliard, aka KGG, has offensive skills made to order for a freelance scrimmage session, and he did not disappoint. At a big 6’5” and at least 250 pounds, he looks like a right tackle turned loose on the basketball court. But a right tackle with mad basketball skills. He could power to the hoop and throw down with either hand like Kevin Tiggs, pull up without hesitation and knock down a three, thread the needle with a bounce pass to Lukas Poderis from just past midcourt, hit Poderis with a wrap around pass in the post. This guy has got a really high basketball IQ – he’s a smart player. And he’s got other weapons in his arsenal that he didn’t even bother to show, like the clever step backs and fall aways featured on his highlight reel. What can you do with a guy who can power past you, using his big body to clear space…, or step back and fall away if you play him for the drive? And who can hit the open man if he’s double teamed? This guy will be a godsend for perimeter shooters like Dubose as defenders try to collapse on him. And for the cherry on top, Murry calls him perhaps the teams’ best defenders – quite a compliment on any team that’s got Sheldon Cooley. Although defense wasn’t exactly at a premium last night. 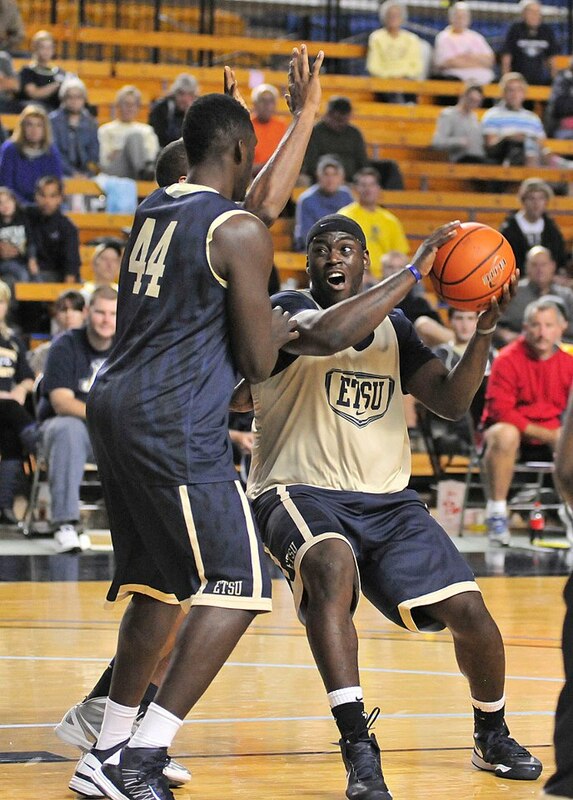 KGG will be worth the price of admission any night he takes the floor for the Bucs. Hunter Harris looked much as advertised at a rangy, powerful 6’7”, 220. He can run, jump and play with energy and enthusiasm. Murry once called him “a wild deer running in the field”. Maybe so, if your deer spends a lot of time in the weight room and isn’t afraid to muscle his way into a crowd. We’ll want to see how he can match up against, say, 6’9” 260 Adam Pegg , or 6’10” Daniel Coursey. We’ll also want to see how he adjusts to the offense, and ETSU’s tricky combination of zone defenses. Lukas looks in great shape and stronger than ever. Hopefully he’ll benefit from the added muscle of Harris and KGG in middle, drawing the other side’s big man. We’ll want to see him playing with energy and abandon. Likewise with John Walton, who flashed his athleticism in a couple of nice moves to the hoop. Then there was Lester Wilson, who clearly put his redshirt year to good use. “The Action Figure” is even bigger, stronger and more athletic than last year, with athleticism and speed that seems effortless. This is a guy who is still developing, but looks about ready to explode with potential. Give him the playing time and encouragement, and he should be something memorable. The scrimmage setting does not favor players without a flashy offensive skill set. So freshman Yunio Barrueta (he called his dunk the “Cuban Missile”)who is a complimentary player who does the little things well was not shown off to advantage. At 6’4” Barrueta reminds one more of 6’4” Ben Rhoda than Mike Smith. He might face be wise to choose a redshirt course while those skills develop. Likewise Providence transfer Ron Giplaye, another powerful addition, who looks like a slimmer version of KGG – he has no choice but to sit out the year. Rashawn Rembert is another player who is still working on offensive skills. With a long, muscular 6’3” body Rashawn would be most likely to get lineup time as defender on big guards and swing men. Next year, after Cooley, Dubose and Jones graduate, the guard spot will belong to him and Petey and Mario. There is no doubt that there is athletic talent on the floor and more muscle than we’ve had in a while, if a little less height than would be ideal. Next step is to assemble these parts into a team that plays together, runs an effective offense and defends as a unit. I think that most folks leaving the Minidome last night couldn’t wait to see the next installment. According to sources, the Bucs have offered Alabaman point guard, Zach Rumph. Rivals lists Rumph as 5’10” 170 lb. With Petey as the lone point guard on roster for the 2013-14 season, there is a clear need for another prototypical lead guard. 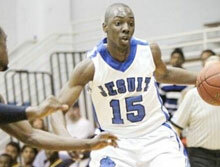 Murry Bartow and company have four scholarships to give for the 2013-14 recruiting class. The early signing period runs from November 14th to November 21st. NKU is a long way from Belmont – but was a very good D2 team, going 23-7, ranking 11th nationally and qualifying for the NCAA DII tournament for the second year in a row. They lost in the first round, 60-59. The season included an 11/4/2011 exhibition win over 19-14 West Virginia in Morgantown. That was West Virginia’s first time on the floor for the season. The Mountaineers apparently had a pretty rough early season: they also dropped a November 15 game to Kent State in Morgantown, 70-60, and barely beat Oral Roberts on November 11, 78-71. http://www.wvusports.com/schedules.cfm?sport=mbball Kent State went on to lose to USCU in the CIS tournament. Speaking of USCU, you may remember that the post transfer USCU bunch was not an easy out in their first ASun year, even though they had been 9-7 in their D2 conference the prior season. Belmont will likely struggle a bit next year as both post players (Hedgepeth and Saunders) graduate. Their replacement is talented, but more of a perimeter guy: 3rd team All SoCon 6’9” JR Drew Windler, a RS JR Samford transfer who averaged 14.4 ppg shooting .426 from 3, but only 3.8 rebounds and 0.4 blocks. Point guard Drew Hanlen also goes. Incoming recruits are all guards, although one, Craig Bradshaw, sounds like another Justin Hare, a physical scrapper who won TN AA POY and AA State Tourney MVP. Belmont will rely on senior guards Ian Clark and Kerron Johnson, and hope that 6’11” Chad Lang and 6’7” Trevor Noack can do more inside than they’ve shown thus far.This year Belmont would probably not have been favored over Mercer, but still would have contended for the ASun crown. NKU probably won’t do that. NKU loses 3 of the 6 guys who logged over 21 minutes in their rotation, including leading scorer Jon Van Hoose, but bring in two highly touted guards, Tyler White, 6’3” Lima, OH, Twice an Honorable Mention big school All-Ohio, and Todd Johnson 5’8” Honorable Mention Indiana All-State. Other recruits are a pair of 6’8” twins, Jacob and Justin Rossi of Franklin, OH and 6’6” Jack Flournoy (Oak Hill; Woodberry, VA) who got offers from West Virginia, Marshall and Ohio U. before tearing an ACL, John Staley, 6’5” forward Dayton Chaminade-Juliene – 17.6 ppg, 7.4 rpg. Nate Snodgrass 6’1” FR PG from Butler, PA – 21.2 ppg, 5.2 assists. They are not an especially big team – the only returning players over 6’5” are 6’7” 190 Ernest Watson (6.3 ppg and 4.7 rpg in 17.4 minutes) and 6’6” 225 Jalen Billups. (5.0 ppg and 2.5 rpg in 9.5 minutes) But this is another ambitious young program that is likely to become a strong addition to the ASun in relatively short order.